First results are in! My computer spent about 20 hours to retrieve and store neighboring concepts of over 10.000 concepts which my Breadth-First-Search algorithm passed through to find the shortest paths between 6 nodes. But here is the result, first the ‘before’ graph, which I showed earlier: all retrieved concepts with their parent relations. 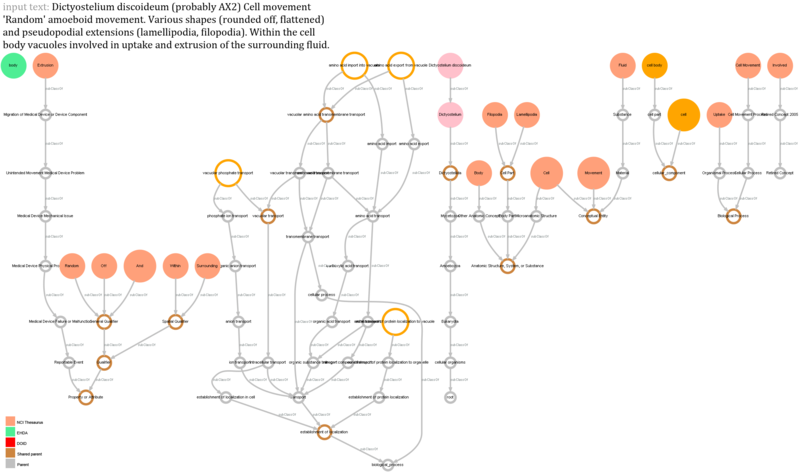 Below that is the new graph, which relates all concepts by finding their shortest paths (so far only the orange concepts – from the Gene Ontology). What were two separate clusters in the first to the left is now one big fat cluster… Which is cool! Less cool is the time it took… But oh well, looks like I’m going to have to prepare some examples as proof of concepts. Nowhere near realistic realtime performance so far… (however I got a big speed increase by moving my Sesame triple store from my ancient EeePC900 to my desktop computer… Goodbye supercomputer). The good news is that all neighboring nodes I processed so far are cached in a local SQLite database, so those 20 hours were not a waste! (considering my total ontology database consists out of over 800.000 concepts, and 10.000 concepts took 20 hours, is something I choose not to take into consideration however :p). It is important to note that the meaning or interpretation of the resulting graph (and particularly the relations between concepts) is not the primary concern here: the paths (their lengths, the directions of the edges and the node’s ‘depths’) will be primarily used for the ontology-based semantic similarity measure I wrote about in this post. Author dvdgrsPosted on November 20, 2011 June 20, 2013 Categories Thesis (MSc)Tags breadth-first search, edges, Gene Ontology, graph, graphviz, nodes, ontology, pathfinder, python, semantic similarity, Sesame, shortest path, SPARQL, SQLite database, triple storeLeave a comment on Pathfinder finds paths!